Finally, you can take full advantage of the power of flow-based methods for analyzing extracellular vesicles (EVs) with SBI’s exclusive ExoFlow-ONE Gemstone dyes. By specifically labeling internal EV components with one of these proprietary, high quantum efficiency dyes, you can achieve near single-vesicle resolution* for more powerful flow cytometry and FACS studies, and uncover greater insights into EV biology. of which are fluorescent. The silica beads, sourced from Apogee Flow Systems, are specifically designed to produce a refractive index and light scattering patterns similar to biological particles, enabling more accurate estimation of EV particle size. *Requires a specialized flow cytometry imager capable of high-resolution vesicle analysis (e.g. Amnis® ImageStreamX Mark II, Apogee Micro-PLUS). **Each reaction is defined as 1 µL of working dye combined with 200 – 500 µg of EV protein resuspended in 500 µL of buffer. Figure 1. Get robust run-to-run- and size calibration with the included size standards. 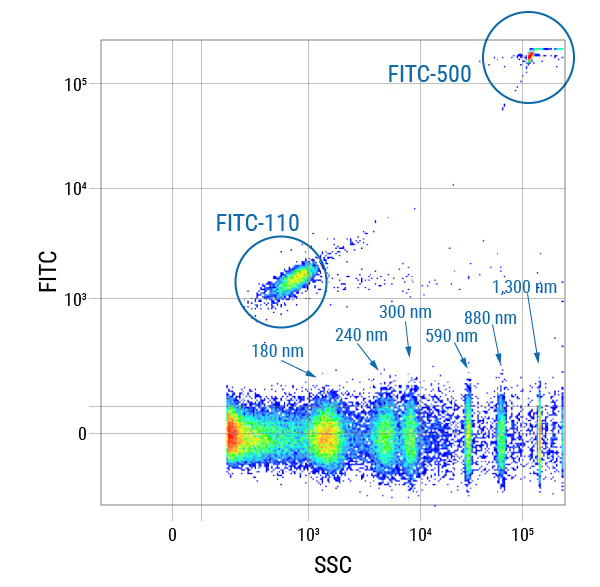 To demonstrate the robustness of the size standards included in every ExoFlow-ONE kit, we ran the standards on a BD® LSR II Flow Cytometer and plotted FITC vs SSC. The unlabeled and two fluorescently labeled size standards (110 nm and 500 nm) provide excellent coverage over the expected size ranges for EVs. Figure 2. The excellent spectral separation of ExoFlow-ONE dyes supports greater flexibility and enables more powerful multi-parametric flow experiments with EVs. 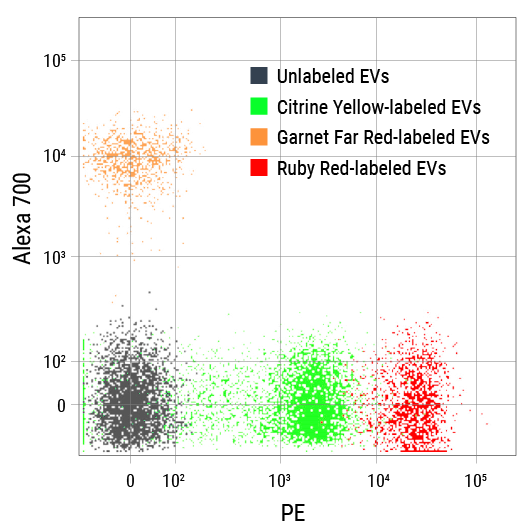 We ran unlabeled EVs and EVs labeled with either Citrine Yellow ExoFlow-ONE, Garnet Far Red ExoFlow-ONE, or Ruby Red ExoFlow-ONE on a BD® LSR II Flow Cytometer, and plotted the signals detected in the phycoerythin (PE) channel versus the Alexa 700 channel. The clear spectral separation of all four EV populations demonstrates multiplexing capabilities capabilities of ExoFlow-ONE dyes. Figure 3. Clearly identify EVs in a flow cytometer using ExoFlow-ONE. 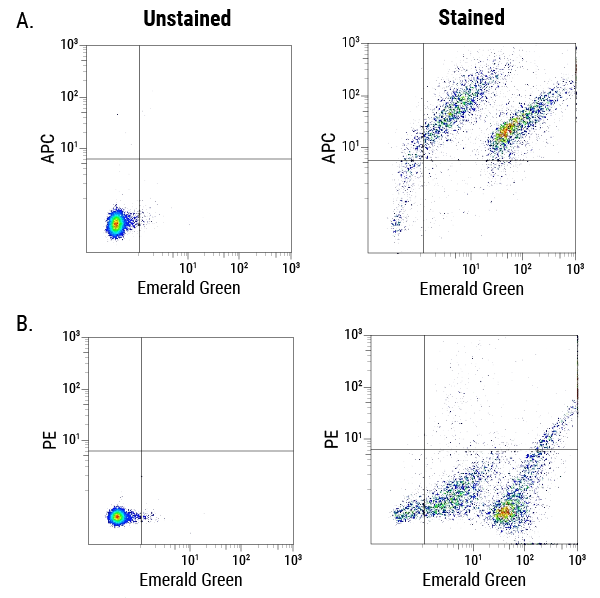 We isolated EVs from human serum and analyzed both unlabeled EVs (A) and EVs labeled with ExoFlow-ONE Emerald Green Dye (B) on a BD® LSR II Flow Cytometer. Using our proprietary size standard beads, we set the gate for EVs larger than 110 nm. 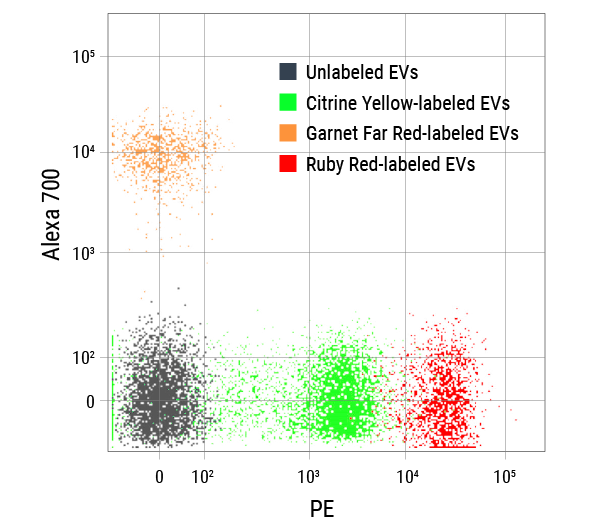 The labeled EVs in panel B can be cleanly detected and distinguished from the background, demonstrating the ability of ExoFlow-ONE labeled EVs to be analyzed via flow cytometry. Figure 4. Identify subpopulations of EVs for flow cytometry. We labeled streptavidin-coated EVs from HEK293 cells with either biotinylated Atto 488 dye (top row), ExoFlow-ONE Garnet Far Red Dye (middle row), or with both biotinylated Atto 488 and Garnet Far Red Dye (bottom row). 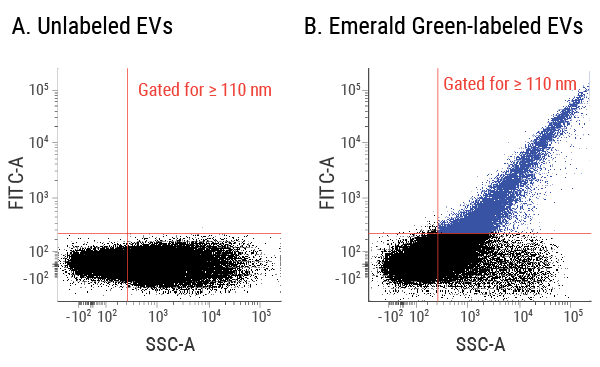 While the single-labeled EVs show fluorescence only in their respective channels, the double-labeled EVs show clear signal in both the 505-560 nm channel as well as the 640-745 nm channel, demonstrating how ExoFlow-ONE can be used to identify subpopulations of EVs using flow cytometry. Data acquired on an Amnis® ImageStreamX Mark II Imaging Flow Cytometer.